If 'will my horse eat it' is your concern, then find out for yourself that even fussy eaters are happy with Aloeride aloe vera powder sprinkled onto their feed. Aloeride aloe vera for Horses 2 SACHETS SAMPLES FREE (made from 0.8 litre aloe vera) are just the job for that, all you do is pay Royal Mail (£1.68 in UK). 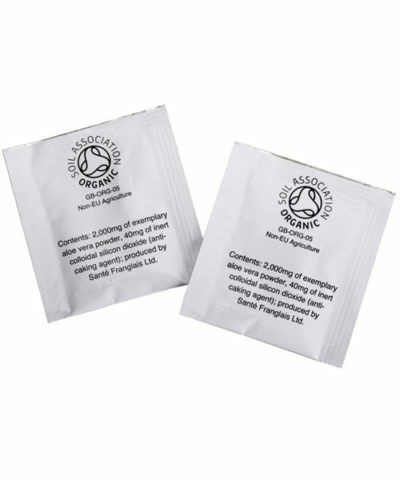 Each sachet gives your horse the goodness of 400 millilitres of Soil Association certified organic, wholeleaf Aloe Vera Barbadensis Miller juice. If you like the prospect of one pure feed supplement looking after digestion and condition and hooves and coat/skin and performance all via 1 sachet a day, then you’re in good company! If you look after what Royal Mail charges us (for online domestic orders this is £1.68) then we’ll pay for the Pick & Pack staff and for a maximum of two 2,000mg Aloeride powder sachets, that is our gift to you. Keep Order Qty = 1 (equals 0.8L) as Qty > 1 only increases your postage. To date no horse has turned Aloeride down but we know, it is nice to see that for yourself. We’re as sure as sure can be that Aloeride will make a difference to your equine friend. We’ve seen this happen time and again. N.B. It takes 0.8 litres of original aloe juice to make 2x 2,000mg Aloeride sachets and 0.8 litres can cost you £16.18 elsewhere, so thank you for seeing what we give to you from that perspective. You too will find it fair that this sample offer is a once-in-a-lifetime offer, repeats or ordering multiples will not be honoured. You may not wish to order this item by telephone as our telephonists only have the option to add UK (about £4.20) or International flat fee postage to a telephone order. Promotion coupon codes do not work on this offer as it’s jolly difficult to discount £0.00. Aloeride aloe vera for horses probably is the most versatile horse feed supplement on the market. It supports digestion whilst at the same time it supports hoof health, condition blossoms and movement palpably eases, natural coat shine simply becomes amazing and with that the natural resilience of skin and coat protects against beasties and the weather, and often behaviour improves when a horse feels more comfortable. Horse & Hound magazine named Aloeride as one of their 2015 Best of British products. 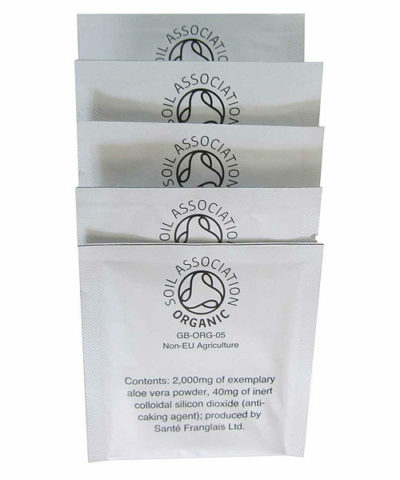 Each carton gives your horse the goodness of 12 litres of Soil Association certified organic, wholeleaf Aloe Vera Barbadensis Miller juice optimised to 30 palatable powder sachets (yes that is 400 millilitre equivalent per sachet). We can supply you with a multi-laboratory proven better aloe vera at vastly deflated cost because we don’t have expensive offices, we don’t finance a multilevel marketing pyramid, we don’t have much staff, we don’t transport liquid aloe, and we don’t seek rapacious profit. Aloeride is used by top equestrians like Loraine Homer, Katie Jerram and Jo Bates (Showing), Leah Bennett (Dressage), Victoria Bax and Eliza Stoddart (Eventing), Sally Toye and Heather Weston (Endurance). Stud Farms and Racing Yards also feed Aloeride, they buy in shippers. They all love what Aloeride does for their horses and our guess is, so will you. Aloeride 100% complies with Consultant Gastroenterologist Dr. Danhof MD PhD’s definition of the best aloe (he is universally recognised as the world’s foremost expert on aloe vera). Every batch of Aloeride aloe vera for Horses goes through a number of tests relevant to competitors including NOPS at LGC in Newmarket. We believe that the above comparison is a matter of public interest and constitutes fair comment without malice. We believe that empowering people to make an informed choice is good. All measurements within our website are factual and are quoted verbatim from the reports we receive from accredited, independent laboratories and we retain such supporting evidence to justify that the statistics are representative of the characteristics of the products relevant for a proper comparison. Outcomes are masked because of comparative advertising, product disparagement and trademark constraints. Happy to give feedback! It is a great idea to allow your aloe vera to be tried out first. 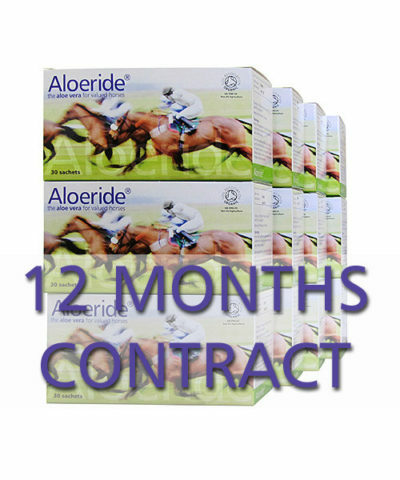 My horse is doing very well on it and, with free shipping, Aloeride is cheaper than getting aloe vera locally. I am in Queensland Australia!!! !